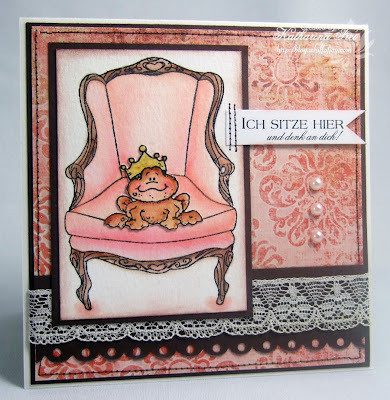 Doesn't this cute little frog prince from High Hopes Rubber Stamps ( I really love this little fellow ;) sit comfortable in this romantic Whiff of Joy armchair designed by Elisabeth Bell? I got a new pack of My Mind's Eye design paper the other day (from the Laundry Line collection). What a wonderful paper, full of glitter and of intense colour! I created the scalloped border with the Stampin'Up scalloped border punch and punched the holes with a 1/8 '' circle punch. I then distressed the edges with a white ink pad to give it a softer touch. 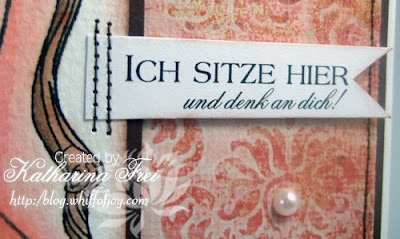 Sitzt der süße Froschkönig von High Hopes Rubber Stamps (an dem habe ich einen Narren gefressen ;) nicht sehr komfortabel auf dem romantischen Whiff of Joy Polsterstuhl designed von Elisabeth Bell? Ich habe gerade einen neuen Pack Motivpapier von My Mind's Eye bekommen und bin total begeistert. So tolle Farben und überall Glitzer (Es ist von der Laundry Line Kollektion). Den Rand des braunen Cardstocks habe ich mit dem Stampin' Up scalloped border Stanzer gemacht und dann die Löcher mit einen 1/8 '' Kreisstanzer ausgestanzt. Die Kante habe ich mit weißem Stempelkissen gewischt um einen weicheren Übergang zu erhalten. I created the sentiment on my computer "Sitting here, thinking about you". Den Text habe ich am Computer erstellt. 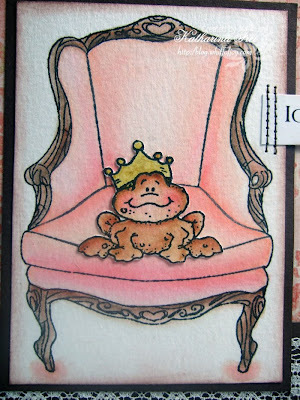 I coloured the frog and the chair with watersoluble pens, Twinkling H2Os and the crown with glitter pens from Spica. Ich habe den Frosch und den Stuhl mit Aquarellstiften, Twinkling H2Os und die Krone mit Glitzerstiften von Spica coloriert. Danke fürs Vorbeischaun! Ich wünsche euch noch einen schönen Tag. a fantastic card hun, your cute frog looks wonderful sat on his chair, waiting for that kiss..! Gorgeous card! Love that frog. Superb card, the frog looks so cute on the chair. Cute frog looks so comfy in the chair. Lovely paper and colouring. Beautiful lace! ha ha such a cutie! a really great card! Love the paper as well and the pearls. gorgeuos card, and the text really fits the motive :D wonderful coloring! What a great idea for a Valentine card! Very fun! The card is beautiful!! Die ist ja süüüüüüüüüüß, der Frosch auf dem Stuhl ist der Knaller. He is so cute perched on his fancy chair, just waiting...Love it! Was für eine witzige Umsetzung des Themas, ist mal was anderes und richtig klasse. I love the paper you've used, really chique. Wow, beautiful card! I wonder if he turns into a prince?? Must get my hands on some of that paper! This is awesome! I love how this card works together eventhough they are different companies! They are so versatile! And I just LOVE that new paper!! I can't wait to play along this week. Nicht so typisch, aber wunderschön und passend für den Anlass. so eine süße Karte wieder!!! The frog and the chair was a perfect combination! =) Great card! Och nee, ist das goldig!!!!!! Phantastisch, so eine süße Idee und so schön umgesetzt. Gorgeous card - love the little frog sitting in his chair. Aw, Katharina, you made me want to give that little frog prince a kiss!! ha ha I love how you put him on such a fancy chair! so sweet! Gorgeous coloring, and papers, yes! I love the lacey border you made too! Very outside the box for me, I love it. It is very neat for me to see others creations to help me think outside the box. Thanks. oh very fantastic card Katharina !!! fun frog in his chair !!! I love it-- he is so cute and your coloring is great!